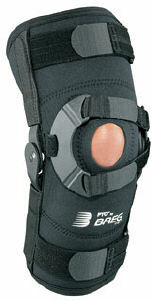 A unique design that not only normalizes patella tracking but also controls knee hyperextension. The patented Cawley Tension Hinge dynamically adjusts the tension applied from the pressure plate on the buttress according to the flexion angle of the knee. As the knee moves into extension, the buttress increases its influence to prevent patella subluxation. Available in both neoprene and BREG's new Airmesh™ fabric. Airmesh™ is a non-neoprene material, ideal for those patients who are allergic to neoprene as well as anyone desiring a breathable knee support for extended daily use. Available with closed or open back.